"Who knows, he may grow up to be President some day, unless they hang him first!" 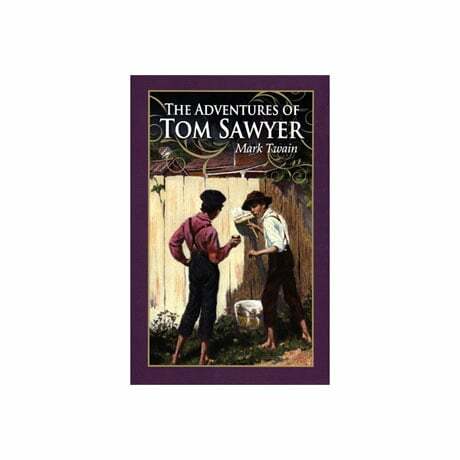 Aunt Polly's summation of Tom Sawyer captures the essence of Mark Twain's rascally hero in this 1876 classic. Living with his respectable aunt in antebellum Missouri and dogged by his nemesis Injun Joe, Tom entangles himself in a series of adventures, including witnessing a murder in a midnight graveyard, running away to become a pirate, attending his own funeral, romancing Becky Thatcher, and finding buried treasure—often with the aid of his friend Huck Finn. With silver page edges, printed endpapers, and foil stamping on the raspberry cover, this compact edition nicely fits the hand, and is presented in an illustrated slipcase.